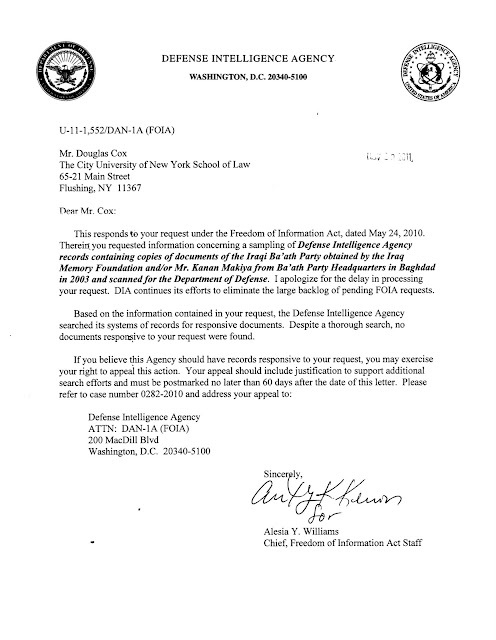 Document Exploitation: Government digital copies of IMF/Hoover documents? Government digital copies of IMF/Hoover documents? The debate over the documents obtained by the Iraq Memory Foundation from Ba'ath Party Headquarters in Iraq and that are now on deposit at the Hoover Institution at Stanford is epic. According to Hassan Mneimneh, director of the Iraq Memory Foundation's documentation project, the group reached an agreement with the U.S. military in February 2005 to have the documents shipped to the United States, where government contractors would complete the digitizing process at a much faster rate. That agreement also provided for the U.S. government to keep a digital copy of the collection. I had assumed the most likely government entity to hold that digital copy would be the DIA. Therefore I requested via FOIA last year a sampling of these records on the basis that, regardless of the ownership of the original documents, the digital copies in the possession of the government ought to constitute agency records within the meaning of FOIA. Morever, access to the government copies would be governed by established FOIA standards for redaction and withholding rather than by the personal restrictions at Hoover. After more than a year and a half, I finally received the response below indicating that "no documents responsive to your request were found." Perhaps the search conducted was inadequate or perhaps the DIA is not the governmental entity that has custody of the digital copies after all. Not knowing which specific agency has custody or authority over seized records is a recurring obstacle.